I'm just starting out and was hoping someone might be kind enough to see what they can make of my image. I've watched and read many tutorials and tried several times with StarTools, both 1.3.5.289 and 1.4.327 alpha, but haven't had much luck getting reasonable results. 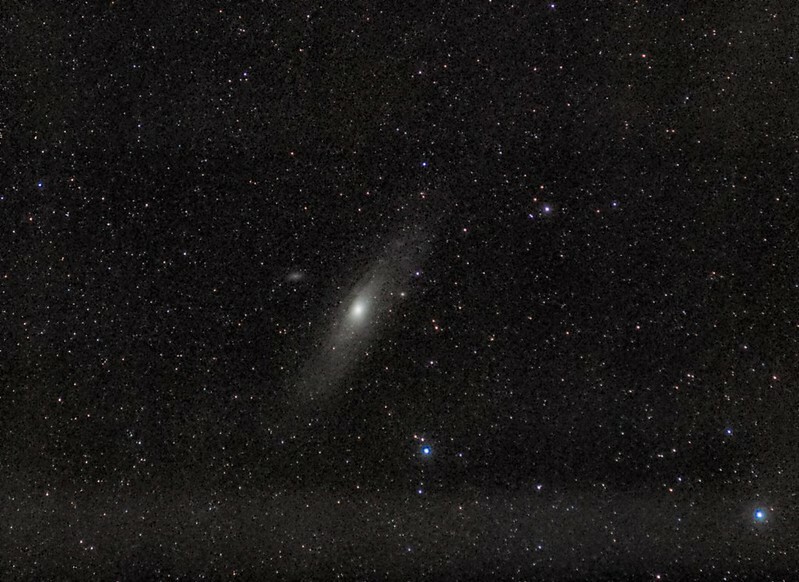 This is an image of M31 taken from my light polluted back yard. Canon T3i DSLR (unmodded), 135mm lens, ISO 400. 48 x 20 sec lights stacked in DSS with 20 darks, 20 flats, and 20 bias. This is the autosave.fts file from DSS. Even a quick run through of a workflow for my image would be helpful. I loaded it, chose option 1 for data type. The basic flow I followed was AutoDev, crop, Wipe, bin, wipe, colour, Dev, Colour, Develop wipe, contrast - a lot of bouncing between colour, dev wipe basically, trying to pull some brightness out of M31. I think it is a very low signal-to-noise ratio here (maye due to light pollution) I used Contrast to darken the background again. End tracking to De-noise, then Magic repair to shrink the stars a bit. With a bit more practice, I'm sure I could improve this a bit. Experts here could surely do better! Here's the startools log file so you can recreate my steps. File loaded [C:\temp\20161123 M31 Andromeda\20161123 M31 Andromeda.fts]. File saved [C:\temp\20161123 M31 Andromeda\20161123 M31 Andromeda.tiff]. Thanks for taking a look. I have no doubt my data quality is pretty low since I'm just starting out with low budget equipment. I'll keep trying. ajreynoelds wrote: Thanks for taking a look at the Hydromax x40 https://www.the5x5project.com/hydromax- ... ew-results I have no doubt my data quality is pretty low since I'm just starting out with low budget equipment. I'll keep trying. That's a great start by the way Mikey. ajreynolds wrote: Thanks for taking a look. I have no doubt my data quality is pretty low since I'm just starting out with low budget equipment. I'll keep trying. The basic flow I followed was AutoDev, crop, Wipe, bin, wipe, colour, Dev, Colour, Develop wipe, contrast - a lot of bouncing between colour, dev wipe basically, trying to pull phenq weight loss some brightness out of M31. I think it is a very low signal-to-noise ratio here (maye due to light pollution) I used Contrast to darken the background again. I'm also a newbie as far as Startools is concerned and your image looks better than my initial images processed. And your data quality is not as low as mine was initially. Keep trying and you'll get better results, And do share the results here for critique as well as suggestions and guidance. Last edited by CharlesVargas on Thu Jun 28, 2018 4:14 pm, edited 1 time in total. EDIT: Bin also speeds things up and is useful for a quick look or to develop a preferred process. There are a few more steps to fix the background with heal and you could apply Life after HDR. Last edited by Rowland on Sun Jul 08, 2018 12:32 am, edited 2 times in total. "Crop" should be in there to? I think that should be just before wipe if I'm not mistaken. Ah! Thank you Richard. My images are auto-cropped prior to opening in ST, so Crop is optional. I will edit the post. ajreynolds wrote: Thanks for taking a look. I have no doubt my Dbal max results data quality is pretty low since I'm just starting out with low budget equipment. I'll keep trying. The basic flow I followed was AutoDev, crop, Wipe, bin, wipe, colour, Dev, Colour, Develop wipe, contrast - a lot of bouncing between colour, dev wipe basically, trying to pull some brightness out of M31. I think it is a very low signal-to-noise ratio here (maye due to light pollution) I used Contrast to darken the background again. I'm also a new user of Startools. ajreynolds, your images look good for me. CharlesVargas, can you share your images? I'll be uploading mine soon, although they're not great.